Brinker International Inc., parent to the Chili’s Grill & Bar and Maggiano’s Little Italy brands, has put its longtime Dallas headquarters campus on the market as it prepares to move to a new building in Irving, Texas, the company said. 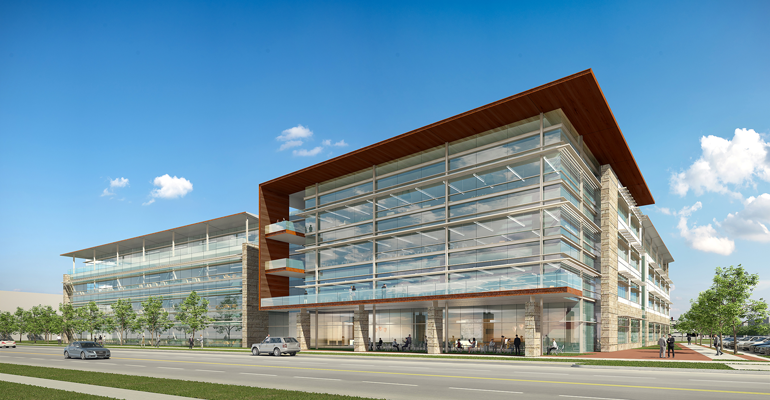 In February, Brinker said it would move its restaurant support center in early 2019 to a new 216,300-square-foot, four-story office building located 12.5 miles west, in The Sound at Cypress Waters development in Irving. “Our move to Cypress Waters allows us to build and custom design a new campus that provides an inspiring and collaborative environment for our BrinkerHeads,” Wyman Roberts, Brinker CEO and president, said in a statement at the time. Brinker opened its current headquarters, originally designed as a multi-tenant office, after the company went public in 1983. The campus covers 7.5 acres; a 110,000-square-foot, four-story main building; satellite offices; and a three-story parking garage along Dallas’ I-635 thoroughfare. Cushman & Wakefield, which is representing Brinker in the sale, said the casual-dining company could do a sale-leaseback up until it departs the Dallas campus. Brinker said the new headquarters will allow the corporate team to work under one roof, rather than in four separate buildings. For the third quarter ended March 29, Brinker’s net income declined 26.3 percent, to $42.4 million, or 86 cents per share, from $57.5 million, or $1 per share, the previous year. Revenue slipped 1.7 percent, to $810.6 million, from $824.6 million the previous year. As of March 29, Brinker owned and franchised 1,660 restaurants, including 1,608 Chili’s units and 52 Maggiano’s locations.